As the summer winds down each year, everyone at Howard Hanna gets a little extra pep in their steps. It’s not that we’re anti-summer. Far from it! No, we’re excited because it’s the time of year when Chairman Hoddy Hanna plans kickoff events that begin the annual fundraising efforts for the Howard Hanna Children’s Free Care Fund. That’s right – it’s Chow Chow season! 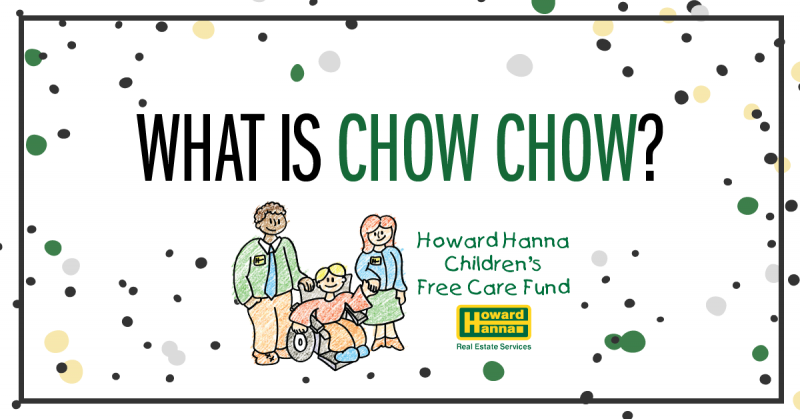 Chow Chows are our annual fundraiser for the Howard Hanna Children’s Free Care Fund, which ensures that children who can’t afford it get the health care they need. But it’s not just one fundraiser. It’s a series of 100+ events across each of our offices. Many offices get really creative and hold themed luncheons, performances, wine tastings, bingo nights, 5k runs, and more! Our fundraising initiatives for the Children’s Free Care Fund started in 1988 with a simple potluck luncheon at our Corporate Office in Pittsburgh, PA. We invited the entire community to join in – clients, family, and friends – for $5 a head. All the proceeds of this first Chow Chow benefited Children’s Hospital of Pittsburgh. We’ve grown from one simple potluck luncheon into over 100 fundraising events every year! Since we started our Chow Chow events, we’ve donated more than $15 million to help children and families in need in our market areas. After all, we live and work here – and we want to help those in our communities! The Howard Hanna Children’s Free Care Fund supports children’s hospitals and related programs and activities in our market areas. Free care funds not only support those who cannot afford or do not have healthcare, but also pay when insurance runs out or for cutting-edge care that insurance does not cover. Today, we work with children’s hospital partners in every region where we have offices. We currently partner with more than 15 children’s hospitals to provide care to those who need it. Attend a Chow Chow event. Here’s a list of fundraising events this year. With so many to choose from, chances are, there’s one near you. You can find the closest one by finding your local office in the “List of Offices” tab. Sponsor a Chow Chow event. If you would like to sponsor one of our Chow Chow events, thank you! Simply find the closest office to you in the “List of Offices” tab, then identify the “Sponsorship” option. Donate to the cause. You can donate directly to our efforts by clicking the “Donate” button on the Children’s Free Care Fund page. Enter our $25,000 Raffle. Simply find the closest office to you in the “List of Offices” tab, then look for the entry option for your local office. Use AmazonSmile. Amazon’s Smile program lets your regular online shopping benefit causes you care about. Go to smile.amazon.com, sign in to your regular Amazon account, and search for “Howard Hanna.” Then, select “Howard Hanna Children’s Free Care Fund” and voila – Amazon donates 0.5% of the price of your eligible purchases to help children in need. While fundraising events are held year round these days, the end of the year will always be “Chow Chow season” here at Howard Hanna. We hope to see you at one of our local fundraising events!